The MT7650B and MT7660A series are high level, solid state noise generators designed for receiver noise figure or noise temperature monitoring applications which require significant decoupling at the point of noise injection. 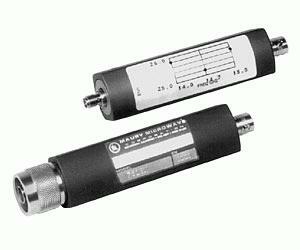 Use of high value couplers reduces noise degradation of the receivers when the monitoring function is not active. These generators operate over a 15 percent bandwidth in the frequency range from 10 MHz to 18 GHz with up to 35 dB excess noise ratio (ENR). The high ENR permits noise injection into a receiver system through a coupler while maintaining an injected noise level compatible with typical noise measuring instruments.